Penguin Random House Office in NYC with Will Wiesser, Terri Sjodin, and Bria Sandford. Terri and her editor, Bria. 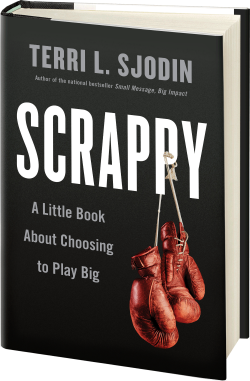 It’s official… the new book I have been working on, “Scrappy!” will be published by Penguin Random House (Portfolio) next year (Fall 2016)! If you would like to learn more about my time in New York and review the formal press release, check out the Presenters’ Post Q2 Newsletter. I’ll be heading back home soon to work on the second draft of the book from the “treehouse” in my backyard. Stay tuned for more updates! I am still collecting great “Scrappy” content and stories for the manuscript – both the clever ideas that worked and efforts that crashed and burned. If you have a scrappy story that you are willing to share with me, please let me know! Thank you for your continued support.